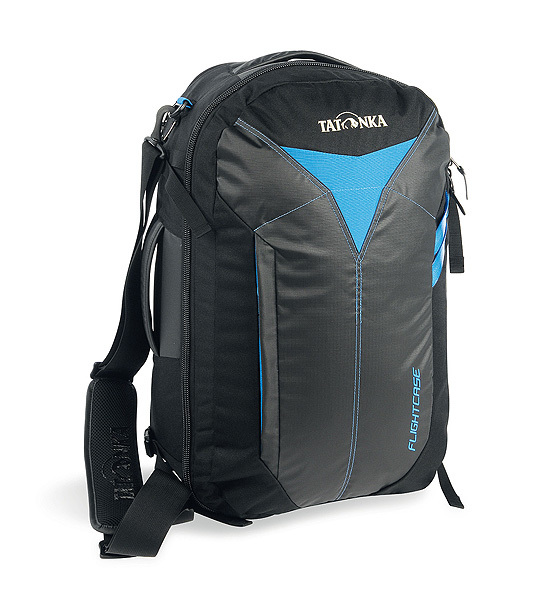 As mentioned in review of my half–photo backpack, I was wary to use it for longer trips. I went looking for a dedicated airplane carry–on bag and frankly there wasn’t much to choose from around here. Tatonka Flightcase was available and seemed like a long running product. On other hand most of reviews online covered older revisions of the bag. I got it in the end and by now it made it through eight flights with me. Since the point of dedicated plane bag is maximizing the use of space in carry–on dimensions, bulk of it went to single large compartment. It spans the whole area of the bag and is closed with lid via solid large zipper. Zipper has loops for a lock, but one is not provided with the bag. 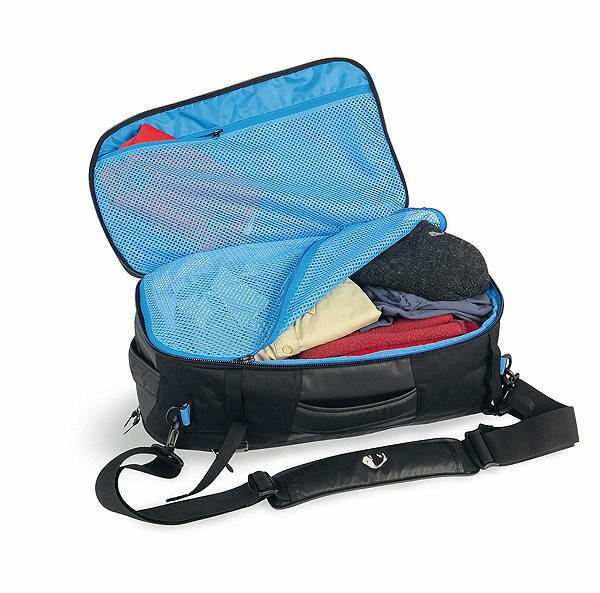 In this regards bag works like a suitcase — it lies flat to be packed. Unlike straps, commonly used to hold things in place, the bag has a large zippered mesh over whole compartment. At start I expected for things to shift under it, but it works quite well. As a note I am also using packing cubes (bought separately) inside, so mesh might perform less well with things packed into compartment by themselves. The lid of the bag has large mesh pocket on the inside and smaller pocket on the outside. The internal pocket is deceptive — it looks rather flat, but the lid can dome quite a bit and can fit quite plenty in addition to main compartment. However this makes bag bulky thick very fast. It’s rather easy to overpack it out of precise carry–on dimensions. I never got a second look in practice, but I also tried to be careful about it. Usually rather than packing clothes into a lid I leave it for smaller things and throw in something bulky (like sweater or hoodie) between the lid and the closed mesh of main compartment. This leaves small stuff able to bounce around a bit. It would make sense to me if lid pocket was split into 2–3 smaller pockets, rather than single large one. The external pocket is usable, but not as large. I used it for liquids bag and passport with boarding pass, but boarding pass printouts start to look very chewed out fast if kept in it. I think the notebook compartment is recent addition, since I hadn’t caught mentions of it in older reviews. It goes in between the main compartment and the backpack straps. Access is through its own zipper on the long side. Access opening doesn’t span the whole length, but it’s enough to get notebook in and out comfortably. This one has been hugely useful to go through security. The one shortcoming with it is that, unlike main compartment, there are no loops for a lock on the zipper. I would kind of expect notebook to be better protected than clothes. Bag comes with removable side strap for carrying on the shoulder. It is wide and well padded. Still, with bag packed full it gets heavy on the shoulder very fast. Highly not recommended mode to jog through airport, late for connection. Behind the foldable cover there is set of backpack straps. Rather than sitting flat against the back, bag has two very prominent vertical lines of foam as a cushion. On the upside it helps reduce suitcase–strapped–to–your–back impression (as opposed to more regular/convenient backpacks). On the downside there seems to be quite a bit of precious thickness space wasted on accommodating nothing but the foam layer. Straps themselves are reasonably wide and comfortable. There are thin belt and chest straps, which are (for once!) removable. They went off immediately, don’t really see a practical point to them on a bag like this. Finally, on the sides of the bag there are four compressions straps. These I hadn’t been happy with. They are too thin and too long (dangling! something always has to dangle!). The way they are positioned doesn’t help them fight the tendency of bag’s center/lid to get bulky either. So far the bag had performed very well for me. I am still tweaking how to pack/distribute things inside, but as soon as it’s closed it just works. The lack of smaller pockets and meh compression straps are the two minor issues for my taste. As part of overall experience they aren’t much detriment though.